Livingston Parish, Louisiana "Livin' in Livingston"
This non-profit genealogy studies site for Livingston Parish, Louisiana is part of the LAGenWebProject. Please visit their home page and help support this project. I am Eddie Bennett, web site manager. Please feel free to e-mail me concerning any suggestions, comments or general questions about this site. If you would like to help by contributing to this page, please contact me. Anything concerning Livingston Parish that would enhance this site or be helpful to Livingston Parish genealogists would be greatly appreciated. If you have transcribed wills,obituaries, cemetery listings, biographies, or other records of Livingston Parish residents, please consider sharing them at this site. To learn more about this project,click here or if you would like to host a parish that is currently up for adoption, contact Edward Hayden, LAGenWeb Project Coordinator. Scroll to the bottom of the page to post a query for Livingston Parish - Please read and abide by the rules. Livingston was originally part of the St. Helena District. 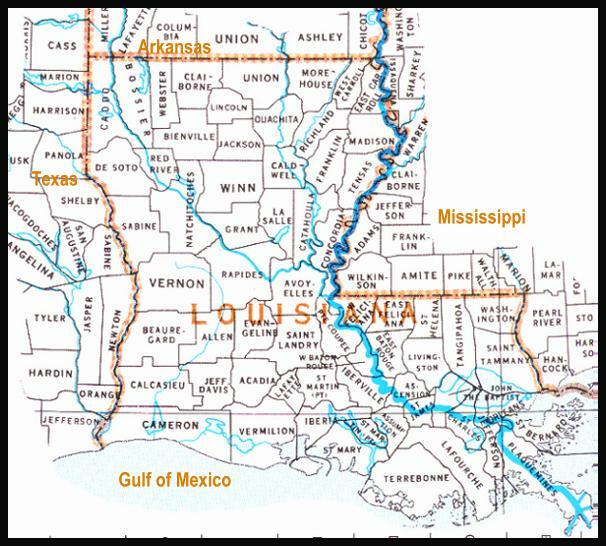 In 1832, St. Helena was divided in half and the Louisiana legislature created Livingston Parish. It was named for Edward Livingston, a prominent statesman who served as a senator, a minister to France, and Secretary of State under Andrew Jackson. By 1835 several small industries were thriving in the area, notably sawmills and brick factories. The timber industry brought the railroads through in the early part of this century, changing commercial and residential patterns. With the construction of modern highways and the encroachment of metropolitan Baton Rouge, Livingston Parish continues to attract residents as well as businesses. The parish is located between the state capitol at Baton Rouge and the city of New Orleans. The parish consists of 642 square miles and is 32 miles long by 30 miles wide. The northern part of the parish consists of rolling terrain covered by pine and hardwood forests about 50 feet above sea level. In the southern end of the parish, the land submerges into rich cypress forests and marshes that border on Lake Maurepas and the Amite River. The parish seat is located in Livingston in the center of the parish. Other towns in the parish are Albany, Denham Springs, French Settlement(so named because of the many French and Acadian settlers), Killian, Port Vincent, Springfield (Livingston's oldest community, incorporated in 1838), and Walker (only 20 miles from the State capitol). Livingston's neighboring parishes are Tangipahoa(east), St. Helena(north),St. John,(south), East Baton Rouge (west) and Ascension(southwest). Please be sure your query has a Livingston Parish connection. If your lines are not in this parish, do not enter a query here. When posting your query, include all surnames in the subject line so they will be included in a national search. DO NOT post gedcom files. If you post a query, and your email address changes later, post a response to your own query giving your new email address. Enter your query by clicking on the "Post or View Current Queries" link below, then fill in the form. When your query is exactly as you want it to appear, "Post Message." Graphics on this page copyright Bayou Graphics and were generously supplied for this site.